Harker Student Joins Fellow Californians in National MathCounts Triumph! The California Mathcounts team, including Harker’s Rajiv Movva, grade 8, won the championship at the Mathcounts National Competition held in Orlando, Fla., in early May. The team of four took the title over 55 other teams representing all states, Washington, D.C., Guam, Puerto Rico, the Virgin Islands, the U.S. Department of Defense and the U.S. State Department. Maryland and Virginia took second and third place, respectively. 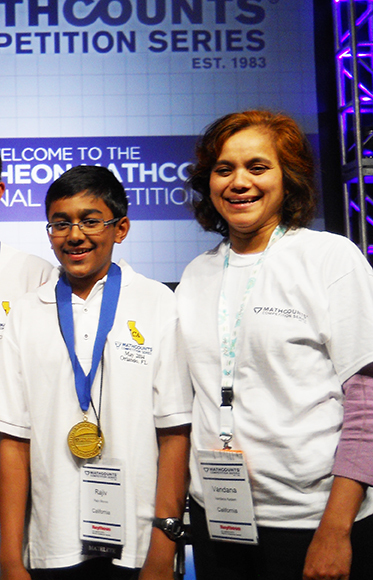 California team member Swapnil Garg of Cupertino Middle School was the individual Mathcounts champion. He will receive a $20,000 college scholarship. Each student on the California team will receive a $2,000 college scholarship and a beautiful trophy. The team members also got a VIP tour of the Magic Kingdom and were grand marshals at the 3 p.m. parade on Saturday, May 10. “Rajiv has been a terrific mathlete and deserves all the accolades,” said Vandana Kadam, middle school mathematics department chair, who accompanied the team as assistant coach and did much of the heavy lifting preparing the team. The official coach was based in Southern California, while all four team members were in Northern California. “Working with four students from four different schools was a challenge, but their weekly practices at Harker helped with the bonding,” noted Kadam, who has been official coach of past California Mathcounts teams. She coached the California team that won the national Mathcounts championship in 2011.